Our drain system is the ideal way to waterproof a basement with a thin concrete slab floor. To schedule a free drain system installation quote, contact us by phone or e-mail today! 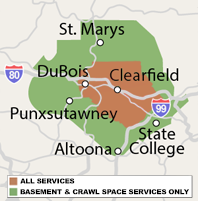 We're proud to serve the Pennsylvania area, including Du Bois, State College, Altoona, Saint Marys, Bellefonte and nearby. Our free quotes are offered to homeowners within our service area including Altoona, State College, Bellefonte, Du Bois, Saint Marys, Pennsylvania and many areas nearby. Each quote includes an on-site inspection and measurement of your basement, a consultation where we make recommendations and answer all your questions, and a customized, written cost quote.